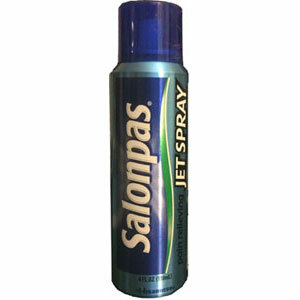 Medicated spray for temporary pain relief. Muscle fatigue, muscle pains, stiff shoulders, lumbago, simple backache, arthritis, strains, bruises, sprains, pains caused by bone fracture, chilblains. Adults and Children 12 years of age and over, clean and dry the affected area before application. Shake the can very well before use. To avoid frostbite, hold the can 4 inches away from the skin, and spray each affected area for no longer than 1 second. Apply to affected area no more than 3 to 4 times a day. Children under 12 years of age, consult a doctor. ~Do not use on wounds or damaged skin. For external use only, avoid contact with the eyes. Use only as directed. Intentional misuse by deliberately concentrating and inhaling the contents can be harmful or fatal. Do not apply on wounds or damaged skin. Do not use with a heating pad. Do not use in a confined space. Contents under pressure. Flammable. Do not use near open flame. Do not use where sparks come out. Do not puncture or incinerate container. Do not store at temperature above 120ºF. Avoid storing product in direct sunlight and heat. Keep this and all medicine away from children. Package not child resistant. Avoid inhalation. In case of accidental ingestion, contact a physician or poison control center immediately. If prone to allergic reactions from aspirin or salicylates, consult a physician before using this product. If you have sensitive skin, do not use. Stop use if condition worsens, or symptoms persist for more than 7 days, if this occurs, consult a physician. As with any drug, if you are pregnant, or nursing, consult a physician before use. If condition worsens or symptoms persist for more than 7 days or clear up and occur again within a few days, discontinue use and consult a physician.